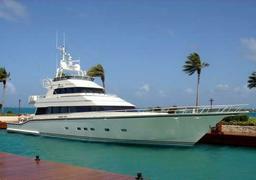 Yesterday, May 10th, was the closing day of the online auction of Hakvoort's 34.14m motor yacht Sea Eagle, built in 1988, so I call Craig Cadwalader of Ardell to find out the result, as he was appointed by the Federal Receiver to run the auction. Craig tells me that it was a long, drawn-out process with four bids received and the winning one coming in at $3.25 million. Sea Eagle was seized by the US Government from disgraced financier Allen Stanford, under whose ownership she had a major rebuild from the hull up in 2005. While he has yet to stand trial, Stanford apparently fought hard to prevent the auction, without success.